Instructions: The ready top fold card base measures, 5 3/4" by 7 3/4". Choose a light teal color pattern paper from the designer paper collection. 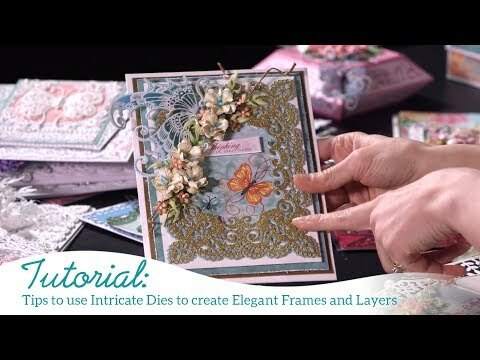 Cut 2 pieces of Eyelet Lace Frames Die, one from pattern paper and another from white cardstock. Layer them together with dimensional tape. Cut a piece of designer paper from little lighter color measuring 5" by 7". Layer the lacy frame on the same and stamp a sentiment from Today's Quotes Cling Stamp Set in the window using Stazon Teal. To this top panel, add a layer of copper color cardstock base, measuring 5 1/2" by 7 1/2" and finally add it to the card base. For flower, Stamp the image from Classic Sunflower Stamp Set with Clear VersaMark Ink twice on Vellum, sprinkle Golden heat embossing powder and dust extra. Heat set them using heat gun and cut the flowers using Classic Sunflower Die. Color all the flower petals using Peacock Feather Oxide ink from the front, let the color sit for a while and then wipe off the excess color with dry tissue paper. Shape all the petals by rolling the petals on the needle tool or golf tool or any back of the paint brush. Glue the petals using Aleene's Fast Grab Glue and form one large, one medium and one small flower. Prick the center using pricking tool, and add a few rock candy stamens and set them using hot glue. For Butterfly, Golden heat set three butterfly images on vellum and cut 2 layers as shown. Color the butterflies using Peacock Feather and Fossilled Amber oxide inks. Shape the top 2 layers and glue all the layers together. Add some Swarovski's for extra interest. For Leaves, Stamp the images of leaves from Classic Rose stamp, cut them using its coordinating die and paint them using Leaf Green and Olive Green Archival Inks. Shape them using Deluxe flower shaping tool and add Crystal Clear using an adhesive that dries clear. Filler flowers are simply cut and shaped using Classic Rose die. Once all the elements are ready, assemble the card as shown.